Yes. Find out more on our Policies – Pricing page or buy a license online. Do I need a guide-I am an expert angler? Yes –Your guide/outfitter will be providing everything you need for your trip to Boxwood. See our list of authorized outfitters and guides. What about bad weather or poor river conditions? If the schools are closed in our area or Metro Denver, due to weather, then we will not expect you to be here. If for some reason, the river is real muddy when you get here i.e. chocolate water with visibility less than 12 inches and you do not want to fish, you will get a refund or full credit. Same with ice over. Boxwood has indoor plumbing and other amenities in the clubhouse. Long Meadow has a Porta-pottie that is professionally maintained. No. See our web-site list for lodging in our vicinity. That’s up to your guide/outfitter to decide but plan on leaving the property no later than 6 PM. None. 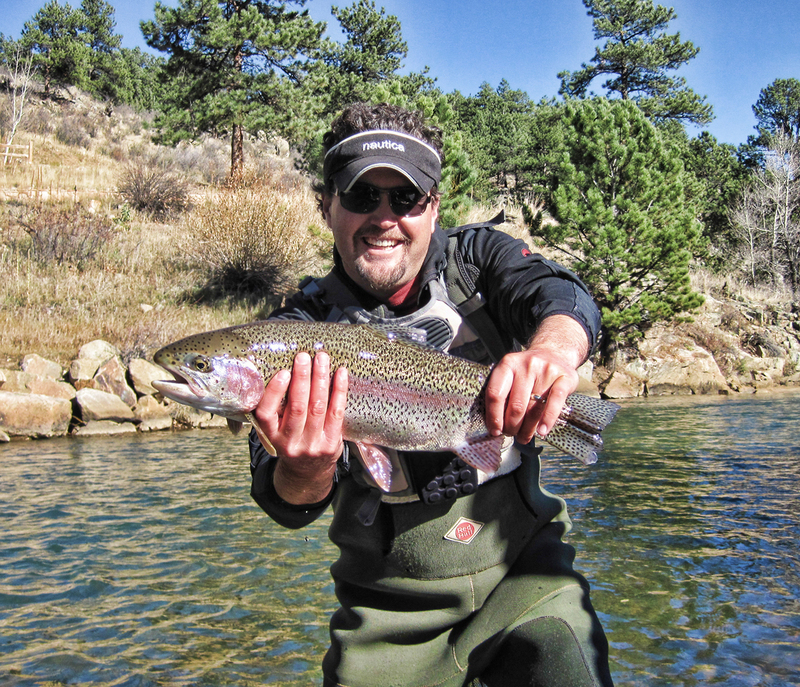 Strictly catch and release barbless fly-fishing. What if a fish dies while I am trying to revive it? If you are very careful handling and reviving the fish this may never happen. If it does, show the fish to your guide he/she will handle the situation. Are the fish some how fenced in? No. They are free to roam the entire drainage, and they do, but they spend most of their time at Boxwood/Long Meadow. Why are the fish so big especially at Boxwood? We take great care of them, especially in the winter. Other than the price, what are the main differences between Boxwood and Long Meadow? Long Meadow has more water—approximately 2 miles vs 1 mile at Boxwood. Boxwood has a greater percentage of really huge fish. 22 inch and larger. Boxwood has a clubhouse and other amenities—comfort in poor weather. Long Meadow may have slightly better dry fly action. How many other people will be fishing the property? Boxwood-If your group is 10 or more anglers only your group will be allowed to fish the property. If your group is less than 10 anglers we may add other anglers. They will have their own guide and share the property independent of your group. Long Meadow- At times you may see other anglers not in your group. It may be the owners, and or their invited guests. Please respect their space and their right to fish their property. Also, if your groups size is smaller than 10 we may add another group. They will have their own guide and fish independently of your group. Can I bring a non-angler? Yes as long as they pay the non angler fee which is currently $75.00 each. Check with your outfitter and their policy on this.